The Lightsheer Diode Laser is one of the most advanced laser systems to date. Research has shown that treatments are safe, accurate, and will effectively eliminate unwanted hairs on tanned or light skin. Both men and women seek laser hair removal services to have superfluous or unwanted hair removed. Hair removal is commonly done on lip, chin, ear lobe, shoulders, back, underarm, abdomen, buttocks, pubic area, bikini lines, thighs, face, neck, chest, arms, legs, hands, and toes. The number of sessions depends on several variables, including the area of the body treated, skin color, coarseness of hair, and gender. In addition, since hair grows in several phases, (anagen, telogen, catagen), and laser can only affect the currently actively growing follicles, (anagen), several sessions are needed to kill hair in all phases of growth. In general, it is necessary to foresee between 3 - 8 treatment sessions. 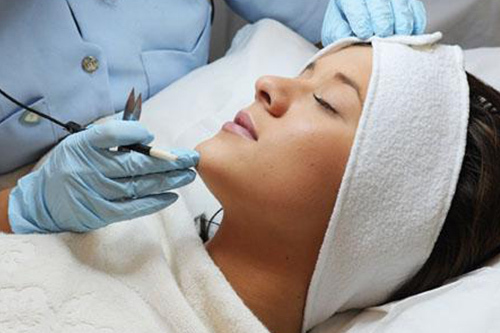 For more than 100 years, the only recognized method of truly permanent hair removal has been electrolysis. With this technique, a fine stainless steel probe is inserted into the hair follicle and a low intensity electric current is applied to the base of the follicle. Effectively eliminating the cells which are responsible for growth. With this method of hair removal all hair colors can be successfully treated and removed. Today, electrolysis is much more comfortable and economical than in previous years, due to computerized epilators. This is a great alternative to laser for small areas like, eyebrows, and blonde and gray hairs. Treatment is also very effective on women diagnosed with Polycystic Ovarian Syndrome or PCOS. With the rise of Bioidentical Hormone Therapy usage, electrolysis has been very beneficial in helping eliminate the side effects (excess hair) of this therapy.